London Wine Week starts on May 23. Timed to perfection, a study by Canada’s University of Alberta has concluded that a glass of red wine equals an hour’s workout in the gym. Hold that thought! Here are 10 properties (for sale or to let) near hidden pubs, wine merchants or restaurants with winning wine lists across Belgravia, Chelsea and Kensington. 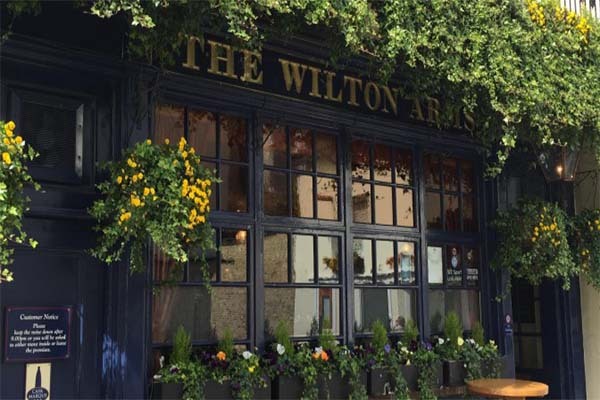 With a floral flourish, the Wilton Arms brightens up Kinnerton Street. You might spot a celebrity if you pop in here, yet these little mews cottages were once stables. In one of the smart mansions along Wilton Crescent, you’ll find this upper floor, four-bedroom apartment for rent. It comes with a lift and roof terrace. Said to be the place where the Great Train Robbery was planned, Belgravia’s Star Tavern also attracted the rich and famous. Diana Dors and Albert Finney enjoyed a drink here, and you could, too, if you bought this flat just around the corner. This two-bedroom apartment also has a terrace if you prefer your tipple outside. If you like traditional pubs, try the Nags Head in Kinnerton Street. It’s a tiny sliver of a building on a hidden street near Harvey Nichols. No mobile phones allowed! Almost next door, if you want to use your phone, this pretty terraced house has two bedrooms, a double-height conservatory and a patio. The Grenadier, in Belgravia’s Wilton Row, started life as the officers’ mess for the Royal Foot Guards, including the Duke of Wellington. This secluded mews house is well within walking distance – in fact you can probably see the pub from the property. Once a bank, 23 Grosvenor Gardens is now a wine bar catering to those with cash in their pockets, rather than in the vaults. The vaults, however, are part of the attraction here. It also has a number of themed rooms, making it a popular party venue. This two-bedroom apartment on Eaton Square is close by. It has a gorgeous private garden and a grand ground floor reception room for your own parties. The Phene is a Chelsea survivor, rescued a couple of years ago from development into a private house. Hugh Grant and Sol Campbell were among those who campaigned successfully for it to remain a pub. It’s popular with the Made in Chelsea cast, and locals in the area. A pleasant evening stroll away up the King’s Road is this three-bedroom duplex in a modern building. Although the Medlar Restaurant on the King’s Road in Chelsea is primarily about food, the wine is an attraction, too. It’s served by a super sommelier who really knows his terroir. If you can tear yourself away, this super-spec town house is just around the corner. It has three bedrooms and comes furnished or unfurnished. Haynes, Hanson & Clark is an independent wine merchant that sources wine directly from the growers. The shop in Elystan Street has a well-stocked cellar, which might be handy if you bought this two-bedroom flat a few doors along. Residents have access to the gym and swimming pool. The Cross Keys is one of the oldest pubs in Chelsea, dating from 1708. It survived a bid for redevelopment as a house. From this lateral apartment on the Embankment, you can wander along the river for a glass of wine at the Cross Keys. Try before you buy! What a great idea. The Sampler in Thurloe Place, close to South Kensington Tube station, is a wine shop with a difference. Up to 80 wines are available to taste at any one time – but maybe best not to try all on the same day! What you need is a house nearby. And what a house this is. A gorgeous five-bedroom Georgian town house with two grand reception rooms, it has access to the magnificent garden square, too.